It’s fair week and for those of you that have experienced this, you know that this means exhaustion and chaos. But in the end, the experiences gained for our children are invaluable. The boys took both 4-H general projects and 4-H livestock projects. While we try to prepare ahead of time, it doesn’t always happen. Part of the 4-H judging experience involves an interview with a judge which is part of the ribbon placement. This week on our way to the general project judging, Keith was researching some information for his vegetable gardening project including what genus family the vegetables were in and learning about the vegetables’ nutrients. He learns this information to prepare for the interview with the judge about his project. As we were driving to the judging and having this discussion, I thought boy this is a unique discussion. Next, we moved into the livestock project area. Poultry judging was Tuesday, and swine judging will be Friday. They both showed well in their respective poultry classes. We had to miss the class they really hoped to show in to see the results of their choices in genetics and their decisions on bird selection. This was a hard decision, but one everyone is ok with. Let me provide some background. Part of the journey of getting to the fair is selecting your birds. The boys went out to their pen of 25 hens on Monday morning and selected their two birds by working together, discussing the pros and cons of each bird, and coming to a common agreement of the final two birds that were going to be shown. In addition, this past weekend Keith was asked to play it in a Miracle Network baseball game for kids with disabilities. We recognized that there was a possibility that it would be in conflict with the poultry judging at the county fair. But thought that given the past experiences at the fair that his class of brown layer hens would be completed before we would have to leave to participate in his Miracle Network event. So we agreed that he should try to participate. Well the time came where we had to make a decision because the poultry show was not the same order as we had remembered so it would now be in direct conflict with the Miracle Network event. So he had to choose between showing his poultry or going to the Miracle Network event. While it was an extremely difficult decision to make, he chose to go to Miracle Network event and invest in another person versus investing in a ribbon for himself. I told him that 4-H is not about the Blue Ribbon. It is about producing a blue ribbon kid, and I thought that he made a Blue Ribbon choice. Black Seeded Simpson Lettuce – A new crop this week. Some of the crops are ran under cold well water to take the field heat off of them so they last longer in your refrigerators. They are not washed – just cooled. So remember to wash your vegetables before eating. Red Salad Bowl Lettuce – A new crop this week. Yum! Beautiful color. Spinach – A new crop of spinach with a few young beet tops mixed in. A close of view of the kohlrabi growing. Grand Duke Kohlrabi – The vegetable judge told Keith that more older people really like this crop. In my conversations with friends, it appears to have no boundaries. We hesitated on this crop but now we love it peeled like an apple and eaten raw and even dipped in peanut butter. Here’s a little history on the crop. Purple Vienna Kohlrabi – Some interesting history of kohlrabi: The plant thrives in the northern regions of Europe and North America. Kohlrabi is native to Europe and is believed to be the only common vegetable native to that area. Kohlrabi was discovered during the 1500s and by the end of the 16th century had become popular across Europe, south into the Mediterranean region and east into Russia and Asia. Kohlrabi was first cultivated on a large-scale in Ireland in the mid-1700s and then later in England. It was brought to the United States just after the turn of the 19th century. Purple Kohlrabi can be found most often in farmer’s markets and in home gardens. Sugar Snap Peas – Glad to finally have a hearty harvest. Enjoy! Detroit Dark Red Beets – Beets were so well-regarded in Ancient Rome and Greece that methods were developed for producing them during the hot summer months. The root part of the beet was cultivated for consumption in either Germany or Italy, first recorded in 1542. Read more here and also see some recipes. Green Bell Peppers – Check America’s Heartland to see how other varieties of peppers are grown. Banana Pepper – Try these in your salad or in scrambled eggs. Cucumbers – This crop is flowering like crazy with many cucumbers starting to grow. We also have dill. If you are interested in canning your own pickles let us know. Carrots – A small taste – enjoy! Green Beans – The first crop of green beans did not grow very well. The cold weather in May appeared to inhibit seed growth. We have more beans forthcoming in the next few weeks. Swiss Chard – If you are like me, you are still trying to figure out how to use this. Check this site out. French Breakfast Radishes – I love the different look of these radishes. Cilantro – Fresh cilantro has such a wonderful aroma. 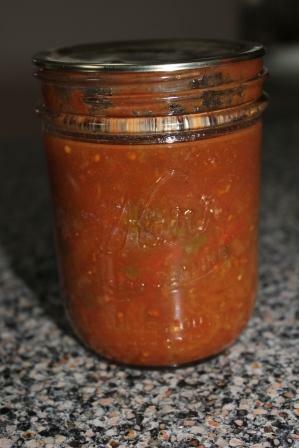 I have been freezing mine to use in canned salsa and soups later this year. The tomatoes are forthcoming if you are holding out for fresh salsa. “With grilled onions and peppers how can you go wrong?” – Steve’s thoughts on this recipe. Enjoy! Philly Cheesesteak – check this recipe out from Pioneer Woman. It has been a busy last few months preparing for the growing season and for 4-H projects at the county fair. Spring is in full swing. Below is a glimpse of some of the activity. At the beginning of March, the chicks that the boys will show at the fair arrived in the mail from the hatchery. They are now about 2 1/2 months old and at the growth stage they boys’ refer to as “high schoolers.” They will be full grown at about 5 months of age when they will be shown at the county fair. Recently, the hens are laying eggs of all sizes. The chicks that Sam’s class hatched this fall are starting to lay eggs. Hens are about 4-5 months old when they are full grown and ready to naturally start laying an egg about every 24-26 hours. The small size that the young hens are laying is a pee-wee egg. The larger eggs pictured are from our older hens that are about 1 1/2 yearss old. At the end of April, the boys bought 3 pigs which they plan to show at the county fair this summer when the pigs have reached their market weight. Pigs are full grown in about 5-6 months when they will weigh approximately 260-280 pounds. After the boys pigs arrived, the local veterinarian visited to check on pig health and discuss the pig’s healthcare with the boys. Farmers work hand in hand with their local veterinarians to provide the best quality care for their animals. We collected soil samples from each of our field areas. Steve made a soil probe collector which would dig down a couple of inches into the field to collect a sample of the soil. We collected 5-6 soil samples from different areas of each field. Labeled the bag and brought the soil samples to our local farm co-op to be tested to evaluate soil health and help us to know what nutrients we should apply to the soil to help grow healthier plants. The rhubarb is growing like crazy. Our rhubarb was transplanted from the farm my dad grew up on. The Harner Brothers are the 5th generation to raise this rhubarb originally planted on the family farm near Tracy by their great-great grandparents after immigrating from Norway and transplanted to our home near Northfield. Last fall, we planted rye grass as a cover crop to provide “green manure” and “feed” our soil with good nutrients. As soon as it warmed up the rye grass began to grow again – just like grass in many lawns. The cover crop has grown well. We are interested in how it will improve soil health and in turn, once tilled into the fields it is currently growing in – how it will help improve soil health which will grow healthy plants and vegetables. During the boys’ spring break, we spent a day doing agriculture in the classroom visits with students in St. Paul. It was a great day, and we are grateful for coworkers and the Minnesota Agriculture in the Classroom for their help. To me inborn fondness means the love for what you do like the smell of the soil, the appreciation of nature, the wonders of miracles witness and a desire to give and do your best in given circumstances for the betterment of all. We try to instill this through action with our children. Harner Brothers CSA donation for a local fundraiser for the boys’ schools. One of those particular ways of sharing our inborn fondness is helping our children learn how to give back. This past week, the boys enjoyed making the box in the above photo and helping to assemble products from our CSA as a donation to the local Montessori fundraiser. It was a great way to give back to a community that has been so supportive of all of us. We started a chick hatching project in the boys’ elementary school. Thank you to Mrs. Sasse for this photo. We also had a fun opportunity to start a chick hatching project at their elementary school. Helping others to learn more about agriculture and to share our inborn fondness is a privilege. We thank all of you for giving us the opportunity to share this growing season with all of you. No growing season is the same, as much as we try to maintain many consistencies, Mother Nature reminds us that she is always in control and keeps it unpredictable. Thank you for letting us share our inborn fondness of agriculture this growing season with all of you! Note: A quick update as we close out the year, look for some Red, White and Blue popcorn later this fall. Once the popcorn has dried to the right moisture content to actually pop into the snack we all enjoy, we will contact you for a delivery. The garlic bulbs were dug from the ground at the end beginning of July. We then braided the tops together. The braided tops were hung up in one of our sheds to dry for a few weeks. Garlic bulbs can keep 6-8 months or longer. Store in cool, stable room temperature (about 60-65 degrees Fahrenheit) with some air circulation, moderate humidity. Store in a brown paper bag or in a hanging mesh bag. Thank you for your support of our CSA. Enjoy the produce! Lettuce mix – a new crop of spinach along with Red Oak Leaf, Spinach, Black Seeded Simpson and curly leaf kale. Black Seeded Simpson, Spinach and Red Oak Leaf Lettuce – I just love to have fresh lettuce and spinach from the garden this time of year. While I love the fall colors, this crop is a joy to bring in my lunch to work. Kale – Brings beautiful color and more nutrients to the dish. Beets – Detroit Dark Red Beets in your box. Boil on your stove top for about 1/2 hour – take them out of the water, using a paper towel gently rub the paper towel over the beet and the skins will come right off, slice into pieces and serve with butter. Slice them and freeze for an easy accompaniment to a meal this winter or cut into chunks and place in Ziploc bag to use in homemade soup this winter. Or blend them up, freeze in ice cube trays and use in smoothies or spaghetti sauce etc. Carrots – Nantes carrots – Do you cook the carrots and the family doesn’t eat them all? I will place the left overs in the blender and then freeze that mixture in ice cube trays. Once frozen, store in a bag in the freezer. I will then use one or two “cubes” of frozen carrots in my spaghetti sauce. Peppers – sweet cherry stuffer, sweet thunderbolt, green and hot dragon cayenne peppers. Peppers – The peppers are really starting to come in. You have sweet cherry stuffer hybrid pepper, sweet thunderbolt hybrid and green peppers in your box. You also have the option of some hot dragon cayenne peppers. Cut up the extra peppers and place in a bag then place in freezer for use throughout the year. Garlic – Enjoy the fresh garlic. I use a hand-held garlic press to crush and peel my garlic. It is awesome and definitely the tool of the week! Here are some garlic recipes to check out. Butternut Squash – My favorite squash. Check out the recipes from Martha Stewart. Refer back to last week’s blog on my how to cook in the oven and freeze for use throughout the year. Red Norland Potatoes – Red Norland potatoes are versatile potatoes – great for boiling, potato salad, and I have had success with them as French fries. Blue Potatoes – check this link out to learn more about different potato varieties. Masquerade Potatoes – We love the taste of this variety. The outside color makes this a fun and beautiful variety to have in the kitchen. Kennebec Potatoes – Great baking potato. Check out harvesting potatoes in Idaho. Cilantro, Basil and Parsley – Plenty to share – take a snip or a plant home and freeze or dry the herb for use in stews, etc during the rest of the year. Here are some more ideas on how to preserve herbs. Corn Shock – If you didn’t get yours last week do to the rains, please let us know. Fun colors of pumpkins this year! Wondering what to do with your leftover mashed potatoes? I use them in this potato bread dough . and either make buns or cinnamon rolls. I freeze the mashed potatoes in 1 cup quantities for a double batch of the recipe. I also freeze the bread as buns or cinnamon rolls. After forming the bread into buns or cinnamon rolls, I let them rise the second time and then I freeze them. When I want to bake them, I simply place the frozen rolls in the oven, turn the oven on to preheat, and once the oven is preheated allow them to cook for the alloted time. Steve has commented several times that he is so glad I figured this out. In your boxes this week. So we decided to try these – Steve does not like beets and I do not like pickles. But this combination was ok by both of us. Please note that there are recipes for refrigerator pickled beets that do not require any canning. Store jars in a cool, dark place and let set for 6-8 weeks before opening. First wash the beets, cut the tops off leaving 1 inch of stem and root on. Boil for about a 1/2 hour or until you can stick a fork easily into the beet. Remove from boiling water and gently rub the skin off. Slice the beets. Small beets can be pickled whole. Larger beets can be sliced in ¼ inch slices or diced. To make pickling brine, combine 4 cups vinegar, 1 1/4 teaspoons canning or pickling salt, 2 cups sugar and 2 cups water in a stainless steel, enamelware, or glass saucepan. Put spices (2 cinnamon sticks and 12 whole cloves) in cheesecloth bag and add to vinegar mixture. Bring to a boil, add beets (and onions if desired) and simmer for 5 minutes. Fill jars with beets and onions, leaving ½ inch headspace. Add hot vinegar solution, covering beets, and allowing ½ inch headspace. Run a thin spatula through jars to remove air bubbles. Wipe jar rims with a damp paper towel. Add caps and bands. For more information on canning, go here. Place filled jars on a rack in a water bath canner. The tops of the jars should be covered with 1 inch of water. Process for 30 minutes. Begin timing as soon as the water begins to boil. After processing is done, place jars on a towel on your counter leaving a few inches between jars to allow them to cool. Last night, sure was a mad dash around the storms. At least now that we are dry and warm, we can look back and chuckle at how dripping wet we all were. In the end, the rain gauge read 4.8 inches early this morning. The end of the year harvest has also been a mad dash, and judging by the forecast, we will continue to have a mad dash to get the crops out around the weather. We are thankful that this weekend the vines and corn crops were harvested and mulched. We still have to wait for those areas to dry out before we can complete our fall field work of tilling and planting a cover crop. But we are thankful for what has been accomplished. Next week will be the final CSA for the year. Look for your share of red, white and blue popcorn to come later this fall after the kernels have dried down. We have to dry the kernels down so that the moisture content is not to high. If there is too much moisture in the kernels, the kernels will not pop, and they will also not store well. Look for your popcorn share to be delivered later this fall. Potatoes are a tuber that grow under ground. Once harvested, they do not grow back. They are an annual that produces one crop. Some of these pumpkins grew to be pretty heavy. Any guesses? The heaviest did weigh in at 68.7, and we did have several over 30 pounds. Lettuce mix – a new crop of spinach along with Red Oak Leaf, Black Seeded Simpson and curly leaf kale. Black Seeded Simpson and Red Oak Leaf Lettuce – I just love to have fresh lettuce and spinach from the garden this time of year. While I love the fall colors, this crop is a joy to bring in my lunch to work. Green Beans – Jade green beans amaze us with their taste. I personally have never liked green beans, but I do enjoy eating this variety raw right out of the garden. Beets – Detroit Dark Red Beets in your box. Boil on your stove top for about 1/2 hour – take them out of the water, using a paper towel gently rub the paper towel over the beet and the skins will come right off, slice into pieces and serve with butter. Slice them and freeze for an easy accompaniment to a meal this winter or cut into chunks and place in Ziploc bag to use in homemade soup this winter. Fresh garlic was pulled mid-summer and then hung to dry. We hope you have enjoyed the fresh garlic this year. Acorn Squash – This small green squash can be cooked fast and easy in the microwave. We were happy to have a beautiful night on Monday to harvest the corn stalks for the corn shocks. These boys worked hard on Saturday morning harvesting gourds, pumpkins and potatoes. They were excited to see the amount of produce they harvested. Gourds – an assortment again this week. Ornamental Corn – The ornamental corn crop was a disappointment. Just not the quantity and quality that we hope to have. This was due in part to the overgrowth of trees in the tree line. We plan to trim those trees back this winter so that they don’t shade out the crops to decrease yields next year like they did this year. Chop onion. I love my Pampered Chef chopper. Great tool for the kitchen!! 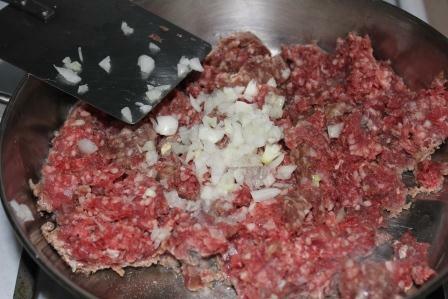 When browning my hamburger, I add a little bit of onion finely chopped so the kids don’t notice it. 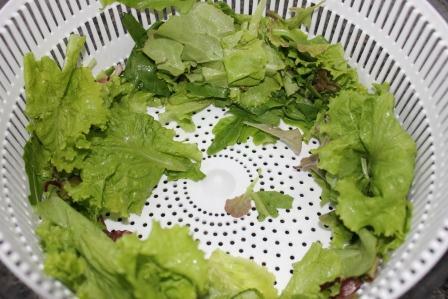 While the hamburger is cooking, I wash my lettuce and place in my salad spinner. Again, the salad spinner is a must have tool. By spinning the moisture off my washed lettuce I find that it keeps longer in my refrigerator. 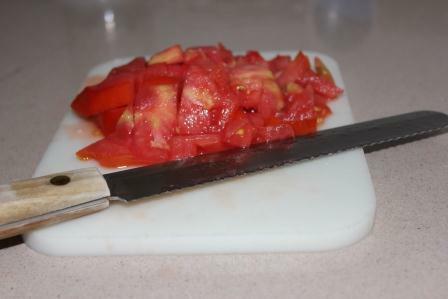 When slicing tomatoes, I have found that using a serrated knife works great. No more smashed tomatoes. I have a designated cutting board in my kitchen for all vegetables and fruits and a totally separate cutting board set aside for only meats. Just an extra safety precaution in our kitchen. Keeping foods separate to avoid cross contamination. Homemade salsa from last year is a delicious addition to this meal. Lazy Tacos – add a side of fruit and a glass of milk, and you have a well-balanced, colorful, fun meal for the family. We are starting to harvest the “fun stuff.” As Sam said, he starts to feel like a kid in a candy store and doesn’t want to stop harvesting the pumpkins gourds, popcorn and ornamental corn once we start. It is so much fun to see the surprises in the garden. There is simply a lot of joy unveiled. We are excited to share that with all of you. We were able to harvest some of these crops this past weekend and will plan to finish those crops this coming week. Look for a lot of Fall decorating items next week. This week marks the official end of the contracted weeks, but we will have a few bonus boxes as we finish harvesting it all. Look for additional communication via email as we begin to wrap up the 2016 growing season. Thank you for allowing us the privilege of growing for you and with you. On one of our rainy days, the boys were out etching each family name in a pumpkin so it grew as part of the pumpkin and appeared as a scar on the skin. Unfortunately not all of them worked this year – as Steve said some of you will get a pumpkin with ‘invisible ink” because those pumpkins did not make it, and we are terribly sad that happened. Don’t worry we will have more pumpkins for you next week. Sam with his name pumpkin. The names were etched using wood carving tools had made by Steve’s great grandpa. This list is prepared before we harvest your share. Some guesswork is involved! We do our best to predict which crops will be ready to harvest, but sometimes crops are on the list that are not in the share, and sometimes crops will be in the share even though they’re not on the list. Remember food safety in your kitchen when preparing, always wash your hands before working with your produce and always wash your produce before eating. Some of the crops are ran under cold well water to take the field heat off of them so they last longer in your refrigerators. They are not washed – just cooled. So remember to wash your vegetables before eating. Thank you for your support of our CSA. Enjoy the produce! Black Seeded Simpson, Prizehead and Red Oak Leaf Lettuce – The new crop is in. The ran sure went hard on it the last few days. Kale – I use the Kale in moderation in my salads. It adds some beautiful color and more nutrients to the dish. Green Beans – Jade green beans. Are you tired of green beans but you would like to preserve them to use this winter? Check out how to blanch them here. These were some large beets! Larger than the boys’ hands. Tomatoes – A variety of 4th of July Hybrid, Sweet Tangerine Hybrid, Roma and Sun Gold Hybrid tomatoes. Peppers – A variety of peppers in our boxes today. You have sweet cherry stuffer hybrid pepper, sweet thunderbolt hybrid pepper and green peppers in your box. You also have the option of some hot dragon cayenne peppers. Butternut Squash – My favorite squash. Check out the recipes from Martha Stewart. Acorn Squash – It was suggested that we try cooking the squash in the microwave and that worked slick. We tried this recipe from Taste of Home and liked it. Spaghetti Squash – I love using this squash instead of regular spaghetti. Better Homes and Gardens shared ways to cook and prepare this squash. This week we are going to try either Rachel Ray’s recipe or toss with butter and Parmesan. Golden Egg Hybrid Summer Squash – Check out squash soup recipes. Kennebec Potatoes – Great baking potato. The first round of gourds have been harvested. A lot of fun differences. This is a family favorite – super easy and moist. If I don’t have a lot of time I will make them as muffins instead of the bread. 1 cup canned pumpkin (I use my prepared butternut squash which has been mixed with butter and brown sugar. The boys were busy teaching friends how to dig potatoes. A skill both boys take for granted. We are “digging” into the harvest literally. Many potatoes, pumpkins and more will come out this weekend. We love the colors and seeing the fruits of our labor. Throughout the season, we want to provide you our shareholders with the opportunity to learn something more. As noted above, the boys have been teaching others how to harvest vegetables this season. A skill that we take for granted. Also, I know it takes an effort to figure out how to preserve the vegetables that we are giving you. We are sharing a few ideas below. Don’t be afraid to email or text if you have a question when you are in the kitchen or trying to figure out how to prepare one of the vegetables. I enjoy visiting with all of you as each of you share different ways you are utilizing the produce. I take the experience and knowledge you share with me so that I can then reshare help the other shareholders. Many thanks for the opportunity to grow for you. We all enjoy seeing youGood luck with preserving the produce to use in your kitchen throughout the year. 4 o’clock were planted in our garden to help draw in beneficial insects to eat the bad insects. The great thing about these flowers is that they self seed. Look closely by the pink flower, and you will see the black dot which is the seed that forms after the flower dies. The seeds will fall out onto the ground and many end up lodged in the soil, and then begin to grow next spring. Tomatoes – A variety of 4th of July Hybrid, Sweet Tangerine Hybrid and Sun Gold Hybrid tomatoes. Hot Dragon Cayenne Peppers on the verge of turning red. Peppers – The peppers are really starting to come in. You have sweet cherry stuffer hybrid pepper and green peppers in your box. You also have the option of some hot dragon cayenne peppers. Onions – yellow candy onions – last of the first crop – look for the second crop next week. Golden Egg Hybrid Summer Squash – Check out some squash soup recipes. Zucchini – The zucchini is at the end of its season. Uff da what a season that was! Hydrangeas and Sedums are tonight’s arrangement. Golden Egg Hybrid Summer Squash – I always wipe them down with a Clorox wipe before I cut them. Using a spoon, I then removed the seeds by scooping them out. In a large saucepan, saute squash and onions in butter until tender. Stir in the broth, salt and pepper; bring to a boil. Serve with crackers if desired. We enjoyed this soup with Townhouse Crackers. My family loves this recipe, and the boys eat it like crazy. I also use the prepared squash in place of pumpkin in many recipes. Butternut squash is in your boxes this week. Butternut Squash – Before cooking I take a Clorox wipe and wipe off the outside. I then cut the squash lengthwise down the center and place the cut side down in the pan. I do NOT peel nor remove the seeds. *Cut squash in 1/2 (do NOT remove skin or seeds). Place cut side down in cake pan. Note: I will do several squash at one time so I only have this mess once, and I have squash to last the rest of the year. *Add about 1 inch depth of water. *Cover with aluminum foil and bake at 375 degrees Fahrenheit for about 1 hour. I will often times leave my squash in the oven for 2 hours. *Take a knife and gently peel back the skin. * Flip the squash over and scoop out seeds. The seeds can be kept and roasted. *Place squash in another bowl. Using a mixer, blend together until smooth. Serve or freeze. Using an ice cream scoop, scoop the squash into cupcake tins. Freeze squash in cupcake pans. Once frozen. Pop out of your cupcake pan and place in Ziploc bags. I use this squash as my “pumpkin” in pumpkin recipes such as pumpkin breads etc. It’s that time of year to be starting to clean-up the fields. Sam started that for us this week by collecting stakes and row markers. The end of the season is in sight, and Fall is near. You can see it in the plants and also in the cool nights. We have started the process of cleaning up and preparing for the end of the season. Watch your boxes as you’ll notice the winter squashes and other larger produce items weighting down the box. It will be a fun few weeks of surprises. We can’t wait to harvest the pumpkins and gourds. Sam and Keith worked at the Minnesota Farm Bureau booth at the Minnesota State Fair this week answering farm questions from fair goers. Black Seeded Simpson, Prizehead and Red Oak Leaf Lettuce – The new crop of lettuce is coming in and is in your box this week. Green Beans – The new crop of Jade green beans. The last crop of carrots will be coming out of the ground for the remaining weeks of the CSA. Peppers – The peppers are really starting to come in. You have sweet cherry stuffer hybrid pepper in your box. You also have the option of some hot dragon cayenne peppers. Spaghetti Squash – I love using this squash instead of regular spaghetti. Learn how to cook this squash from Martha Stewart. Zucchini – The zucchini is still producing. So since we had extra, we made you some Cinnamon Zucchini Bread. See recipe below. Sam helped me make garlic butter for our garlic bread this week. We love my OXO garlic press. 1. In a small bowl, combine butter and garlic. Brush over cut sides of bread; sprinkle with parsley. Place, cut side up, on a baking sheet. 2. Bake at 350° Fahrenheit for 8 minutes. Broil 4-6 in. from the heat for 2 minutes or until golden brown. Cut into 2-in. slices. Serve warm. Yield: 8 servings. Cinnamon Zucchini Bread – In your boxes this week. Thank you to Sarah Durenberger at From the Farm Table for sharing this recipe. I used applesauce instead of oil. Beat together the eggs, sugars and oil. Bake at 325 degrees Fahrenheit for 45-50 minutes, or until toothpick comes out clean. Potato harvest is in full swing. Good team work was needed to dig these up. It’s always fun to find the giant potatoes in the group. It’s amazing how every growing season is unique, and each year different things go better than others, whether it is planting, pest management, plant health, time management, soil health etc. Every year, we are learning something new and trying to apply what was learned previously to build upon doing better during that given year. Each year’s weather pattern is different with Mother Nature always being predictably unpredictable. At this point in the growing season, we are excited as we examine the squash, pumpkins and popcorn. We are frustrated as we look at the negative insects and their effects on the broccoli, cauliflower, cabbage and potatoes and exhausted with the number of plantings that we have done for sugar snap peas, lettuce and carrots. But we are hopeful and excited as we see that the harvest year end is quickly going to be upon us. The reason we are so excited – because we love harvesting the pumpkins, squash, gourds, popcorn and ornamental corn. It truly is like Christmas in the garden. Take time to check out what is growing on before the craziness of school starts. It really is starting to change with September just around the corner. There is a lot to absorb and see. Farmers and ranchers across the United States provide a great deal of wildlife habit. As we were working in the garden, we discovered this small nest of newly hatched birds. The boys were so excited to simply watch these young lives. Red Oak Leaf Lettuce – I have replanted this crop no less than 5 times, and we are starting to see a few varieties peek through the ground. Green Beans – A new crop of Jade green beans. Kohlrabi – Green kohlrabi in your box. Peel it and eat it like an apple. Beets – Detroit Dark Red Beets in your box. Boil on your stove top for about 1/2 hour – take them out of the water, using a paper towel gently rub the paper towel over the beet and the skins will come right off, slice into pieces and serve with butter. Carrots – Purple Dragon and Nantes carrots that were planted at different times and in different soil types – your feedback is appreciated. Tomatoes – A variety of 4th of July Hybrid, Sweet Tangerine Hybrid and Sun Gold Hybrid. Garlic – Enjoy the fresh garlic. 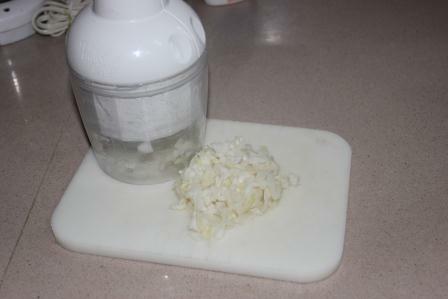 I use a hand held garlic press crush and peel my garlic. It is awesome and definitely the tool of the week! Here are some garlic recipes to check out. Spaghetti Squash on the left and Golden Egg Hybrid Summer Squash on the right. Zucchini – The zucchini is still producing. So since we had extra, we made you some Double Chocolate Zucchini Bread. See recipe below. Red Norland Potatoes – Red Norland potatoes are versatile potatoes – great for boiling, potato salad and I have had success with them as French fries. A favorite in our house. Find this recipe and more ideas on my friend’s blog at From the Farm Table. Checking out the garden and finding the largest white pumpkin – bonus – a fun way to end the day. It’s always a treasure hunt to see what is hiding under the large pumpkin leaves. Often times in agriculture, we don’t always talk about the challenges that occur with the crops. Simply because we like to be upbeat and look at the positive. Speaking of positive, you should check out all of the pumpkins, squash and gourds growing – that harvest is just around the corner and the sizes of the pumpkins etc and the colors are fun to look at. There are always challenges every crop year, and each year is unique unto itself. Lettuce and Spinach – This crop has had actually 6 plantings. We have received 3 crops. The intent was have at least 2 more quality outcomes in new plantings but that was not what God intended. We are really happy to see two different varieties growing quite well, pictured, and are hopeful for a new crop in a week or two. The potato bugs are again a challenge this year even though we plant flowers to bring in good insects who like to eat potato bugs and attempt to control them with other methods. They are eating potato plants, tomato plants and more. Learn more here. Squash bugs are appearing in great numbers. We will be monitoring them and whether we will need to an insecticide to control them from damaging the pumpkins and squash. Learn more here. Splitting of the carrot root is also occurring due in part to the excessive amounts of rain we have been receiving at one time over the last few weeks. The carrot simply receives a lot of moisture at once, grows fast, and splits. We are also having these black spots on some varieties of the tomatoes. Check out more information here. Red Oak Leaf Lettuce – I think God is trying to give you a break on lettuce. I have replanted this crop no less than 5 times. I see a variety is peeking through the ground. Cherry Belle Radishes – Last of this crop. Zucchini – The zucchini is still producing. So since we had extra, we made you some zucchini brownies – enjoy. Tomatoes – A variety abound. Enjoy some BLTs. Sweet Corn – Thank you to FarGaze Farms for sharing some extra sweet corn. Our sweet corn is between crops. Preserve the corn for winter eating simply by cooking it, cut it off the cob, place in Ziploc bag and place it in the freezer. Cilantro, Basil and Parsley – Plenty to share – take a snip or a plant home and freeze or dry the herb for use in stews, etc during the rest of the year. Spaghetti squash was in you box last week. Still wondering how to cook it? I have the best luck putting it in a large bowl of water and bowling it for about 1 hour or until I can easily stick a fork into it. Take it out of the bowling water and cut open lengthwise. Scoop out the seeds. Take a fork and scrape it out so you get the noodle effect that is naturally occurring. Serve it up like a regular meal of spaghetti. Enjoying the evening sunset together as we harvested sweet corn. In the end, we all just want more quality time with our loved ones. No technology, just Mother Nature and good conversation. Whether at a baseball game or at the dentist office, we end up discussing summer activities with our kids, challenges as working moms balancing summer schedules, and concern for our kids as they enter into a new school year. We share a lot of the same concerns even though, what we have most in common is being parents, and the love we have for our children. These conversation also end up including our CSA or questions they have about farming. Questions range from how our CSA is doing with the weather to what’s working and what’s not working compared to what they are experiencing or seeing in their area. These conversations are often times with friends that grew up in town and/or currently reside in town. We also discussed how the food is grown and technologies in agriculture. We, meaning all four of us, enjoy the conversations and the opportunity to help others gain a better understanding for how food is grown. We are happy to answer questions that others have about what we do. What matters, is that in life we are always learning. After all, it is simply fun and interesting to learn how food is grown and raised to feed our families. Purple Beans – Just a taste this week. These were some overgrown beets. Beets – Detroit Dark Red Beets in your box. Check out how to cook them here. Cherry Belle Radishes – They may be small but their taste is mighty. Enjoy in a salad or a radish sandwich – on buttered bread. Zucchini – The zucchini is still producing. Wondering when it will slow down. Cucumbers – This crop is dwindling. You will get a break from cucumbers shortly until a new variety of this crop comes in. Plenty of tomatoes to harvest. Tomatoes – A variety abounds for you this week. Onions – Snow White hybrid and Giant Red Hamburger onions. Sam’s neatly stacked sweet corn. Sweet Corn – One of summer’s favorites. Yukon Gold Potatoes – A beautiful golden variety of potato. Learn some fun facts about potatoes grown in Minnesota and the Northern Plains here. These zucchini brownies are a favorite. •In a large bowl, combine the flour, cocoa, baking soda and salt. In a small bowl, combine the zucchini, sugar and oil; stir into dry ingredients until blended. Stir in walnuts and vanilla. •Pour into a greased 13-in. x 9-in. baking pan. Bake at 350° F. for 35-40 minutes or until a toothpick comes out clean. Cool on a wire rack for 30 minutes. •In a large saucepan, melt butter; stir in sugar and milk. Bring to a boil over medium heat, stirring frequently. Cook and stir 1 minute or until smooth. Remove from the heat. Stir in chips and marshmallows until melted and smooth; add vanilla. Spread over brownies. Sprinkle with walnuts if desired. Yield: 2 dozen.